equipment recommendations are therefore not merely revised and tweaked, but completely revamped. During these two decades we have also seen a deepening of environmental consciousness. Not only has backpacking become more popular, but a whole ethic of responsible outdoorsmanship has emerged. In this book the authors confidently lead us through these technological, ethical, and spiritual changes. Fletcher and Rawlins’s thorough appraisal and recommendation of equipment begins with a “Ground Plan,” a discussion of general hiking preparedness. How much to bring? What are the ideal clothes, food, boots, and tents for your trip? They evaluate each of these variables in detail—including open, honest critiques and endorsements of brand-name equipment. Their equipment searches are exhaustive; they talk in detail about everything from socks to freeze-dried trail curries. They end as they began, with a philosophical and literary disquisition on the reasons to walk, capped off with a delightful collection of quotes about walking and the outdoor life. After a thoughtful and painstaking analysis of hiking gear from hats to boots, from longjohns to tent flaps, they remind us that ultimately hiking is about the experience of being outdoors and seeing the green world anew. 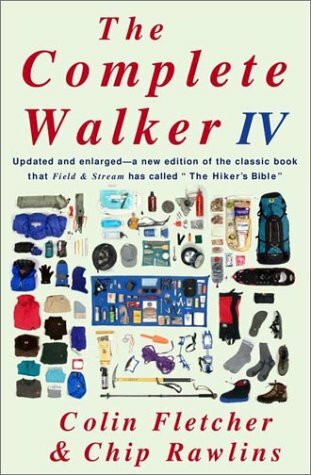 Like its predecessors, The Complete Walker IV is an essential purchase for anyone captivated by the outdoor life. From the Hardcover edition. Colin Fletcher was born in Wales and educated in England. He lives in Carmel Valley, California. A former Wallace Stegner Fellow at Stanford University, Rawlins has written previous nonfiction books—Sky’s Witness: A Year in the Wind River RangeandBroken Country: Mountains and Memory—and poetry, with a recent award-winning book,In Gravity National Park. He served as president of the Wyoming Outdoor Council and on the board of directors of the Greater Yellowstone Coalition. He lives in Laramie, Wyoming.